I may, or may not, have titled this post with Casper the friendly ghost in mind. It really is a fitting title though considering how friendly the people of Casper are. That being said, I want to catch you all up on my latest trip to Casper, Wyoming! I also hope to have this post serve as a travel guide for those of you who find yourself wandering this quaint town. This past June my mom took a job out in Casper and has been there since. Both my brother and sister since then have visited her – making me the odd man out. After multiple reminders from my mom, that I, her oldest daughter had not yet visited her, I decided to make the jump and grab plane tickets while they were astonishingly low this January. And I am so happy I did! That being said, I arrived in Casper late last Tuesday night. The next morning, I did my research on coffeeshops in the area and headed out to Java Jitters Espresso to grab coffee and a bite while working remotely for the day. Looking for anything to eat, I was recommended their breakfast bagel – which was exactly what I needed. It was so good and very reasonably priced! I chose to work at this cafe due to the beautiful brick walls and modern rustic feel from the images I found on Google (thank you Google for helping me find cool places). Living in Portland has made me very picky with my coffeeshops, so I was glad to have found such a cozy place to work. The only downside? The music was a tad bit too loud. This only bothered me because I had a few meetings to attend and having Bon Jovi blaring in the background was less than ideal. Thankfully, my phone headphones did a great job blocking out the background noise. Thank goodness! After work Wednesday, my mom and I headed over to FireRock Steakhouse. My mom fell in love with this place after her coworkers took her to dinner here when she was interviewing last year. Since then, she has brought both my siblings here and now myself! I soon understood why this place was such a hit. It’s cozy fireplace, delicious food, and great happy hour deals definitely made this place attractive. I mean, who wouldn’t want to sip wine for less than $8 next to a warm fireplace while enjoying a steak? Let’s be real here, this is the cozy person’s dream! I ended up ordering their ribeye steak (cooked medium, which according to Ian was a mistake 🙄) with a side of steamed veggies and man was it good. Wanting something a little lighter, my mom ordered their chopped salad with steak strips (and no bleu cheese). The two of us had a great time eating delicious food, enjoying the fireplace, and catching up on my mom’s latest trip to Africa (how cool!). Room they use for hosting dinner parties and large groups. We then drove around after dinner looking at homes and I couldn’t help snapping a few pics of some of the most historic as well as newest homes there. Does anyone else love looking at how architecture styles change all around the country? The craziest thing I noticed about some of the homes here? They love having RV garages! Thursday, after work, we tried out a sushi place in Casper. While I really want to write a good review on it.. I can’t. The sushi was alright, but for how much it ended up costing it really was not worth it. There are a few other sushi places in Casper, so maybe the other restaurants may be more worth trying. That being said, I won’t make any sushi recommendations in Casper on here (unless one of you recommends a great place). On Friday, after I finished working, we headed to Backwards Distillery. One of my mom’s coworkers recommended it when he heard I was in town visiting. From the outside, it doesn’t look like much. In fact, had I just driven by it I probably wouldn’t have stopped to check it out. BUT it is not on Visit Casper and and Travel Wyoming‘s websites for nothing. This place is a true gem of Casper’s. Known for their gin, vodka, and rum, Backwards Distilling Company recently introduced their very first American Whiskey and wow was it good! Unfortunately, they are sold out of it in most places so it will be difficult for anyone to get their hands on a bottle of it anytime soon. Goes to say how good this stuff is! Their cocktails? ABSOLUTELY AMAZING. Their cocktail menu consisted of the basics but also more adventurous varieties. My mom ordered one of their pumpkin cocktails and I ordered their “Zorella Brothers” cocktail which was absolutely amazing. I was nervous to try this cocktail considering the fact that it had butternut squash in it.. but wow. It was so good. I wish I could go back and have another! When I asked them about how they managed to put butternut squash in a cocktail they told me that they have a juicer that they use for their cocktails and juice all of their veggie and fruit juices daily. YUM! After enjoying a cocktail at Backwards Distilling Company, we headed over to Wyoming Ale Works and enjoyed their very reasonable happy hour menu! We wanted to save room for Rialto’s Soda Shop, so we shared a few happy hour appetizers and hung out for a little while. We weren’t even there during their peak hours and it was already filling up inside there. My mom told me that during the summer, they have an outdoor fireplace that a lot of people like to sit by while enjoying a beer with good company on a summer night. I was also really digging the buffalo mural. So cool. After dinner, we headed over to Rialto Soda Fountain. One of my mom’s coworkers raved about their diy soda bar and how they had created a s’mores float that had fire roasted marshmallow on top. Once inside, I immediately felt as if I had stepped back into time. In fact, it kind of reminded me of Margie’s Candies in Chicago with the old fashioned decorations and cozy interior. The coolest part about Rialto Soda Fountain? It’s history! While there, we sat at the bar where the residents of Casper had been sitting since 1925! The owner of the shop talked to us about its history and his plans for the shop. In 1922, the shop first started out as a McDonald’s Seed Store and in 1925 became the Rialto Soda Fountain/Cigar Store. Next door, the Rialto Theatre opened up, which is still there! Since then, residents of Casper would meet up at this little shop to smoke cigars and drink soda before heading over to the theatre for a show. It wasn’t until June 2018 that the current owner purchased this store and turned it into the Rialto Soda Fountain (minus the cigars). The owner’s Rob and Vivian, then renovated this shop to best mirror what it looked like back in the late twenties but also worked hard to remove the cigar smoke build up that had damaged the shop. Rob was working the shop when we visited and he was an absolute pleasure to talk to. It is from him that I learned about this shop’s history and its importance to him and his wife Vivian, who is a member of the historical society in Casper. The next morning, my mom and I headed to Eggington’s – a local favorite for brunch. And a favorite it was! Once inside, we were put on a 30 minute wait list! Everyone in town seemed to be in line for a table there. Lately I have been really craving Egg Benedicts, so I chose to order their tradition benedict with a side of coffee. They had multiple variations of egg benedicts to choose from, including their Cowboy Benedict, but I just wanted to keep things simple and go for a classic. And of course, it was absolutely delicious. And as if we didn’t eat enough for breakfast, we decided to split one of their ombre cakes. I was absolutely stuffed after breakfast. So worth it though. To keep the fun going, we decided to stop by Artisan Alley. We had driven by it multiple times and after driving past it again on Saturday, we decided to finally go it and get our creative juices flowing. Inside, they have multiple rooms dedicated to the creation of artwork.. but they also have a bar area where you can order a water, soda, or local wine. How fun! That day, they were offering a class on painting sloths.. which I was extremely tempted to partake in, but we decided to do our own thing and paint on their wooden boards. In their studio you can paint ceramics (in their backroom), canvas, or on wooden boards (in their front room). We first began our project by staining our wood pieces. They also have templates that you can use to help with creating your wooden board painting, which is perfect for those of us who worry about getting paintings just right. My mom chose to create a world map with the quote “those who wander are not lost”, so having a world template and a template for that quote made creating her piece much less stressful. Sometimes it’s just nice having some guidance! I wanted to paint Winston, so I asked if I could somehow make a template of him to help me with painting him proportionally, something I really struggle with. To all of our surprise, we were able to create a decent template of him from a photo I took of him a few weeks back. Unfortunately, once I removed the template.. there wasn’t much on the board that I had painting. All that remained was an outline of his nose, eyes, ears, and bandana so I needed to rely on his photo to paint all of the light parts of his body. It definitely became tricky once I needed to work on details such as curls, his fluffy hair ontop of his head, eyes, mouth, and his nose BUT the girls working there were AMAZING. Marissa, helped me out SO much and for that I am thankful! The end result? A painting that I will keep for years to come! I don’t plan on ever getting rid of this! Mom and I with our finished pieces! Me with the two amazing girls that helped me with my painting! Honestly, this place may have been the highlight of my trip. The girls working there were so helpful AND fun. The music playing was on point (80’s and 90’s throwbacks, oooohh yeeeeeahhh). I mean, the atmosphere in that place was incredible. To end my trip, we made a final stop at C85 Wonder Bar, which was also a good time! The screens throughout this place were perfect for watching sports games while enjoying good food and beer. Had I been in town for the Super Bowl (and actually cared to watch it this year), I would have loved to have hung out there with a good ol’ beer in my hand. The bathroom was also really cool, and yes, I took one of those 2010 bathroom selfies. How could I help it, the mirror in there was so cool. Judge me. While there, we shared chicken tacos and I tried a Salmon Fly Honey Rye beer and oh my gosh was it good. I wanted to try something “local” and the bartender recommended this beer for me. However, when I looked up this beer I learned that “local” was actually Montana… so I guess that is close enough? Who cares, it was delicious. In an effort to be somewhat healthy that day, we both ordered their C-85 Chopped Salad which was also really good. AND that just about sums up my trip to Casper! I had an absolute blast visiting my mom and exploring not only a new town, but a new state! I absolutely adore Portland, but sometimes it’s nice being able to take a break from city living and slow things down a little in a small town. 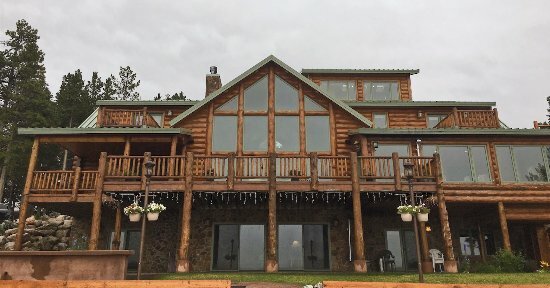 For those of you who find yourselves in Casper, Wyoming one day I thought I would throw together some of my recommendations from when I was there. If you have ever been to Casper and feel that I have missed something, please please comment below and let me know so that I can add it to this guide! 😁 Unfortunately, I was in Casper during Winter, so this guide will mostly capture what to do and see during their colder months. I guess I will have to head back there during the summer to give you all tips on what Casper’s great outdoors have to offer! + FireRock Steakhouse – a cozy steakhouse with great happy hour deals and a cozy fireplace. + Wyoming Ale Works – lively restaurant with a large beer selection and awesome happy hour deals. During the summer this place has an outdoor patio with a fireplace outside that locals enjoy sitting around. 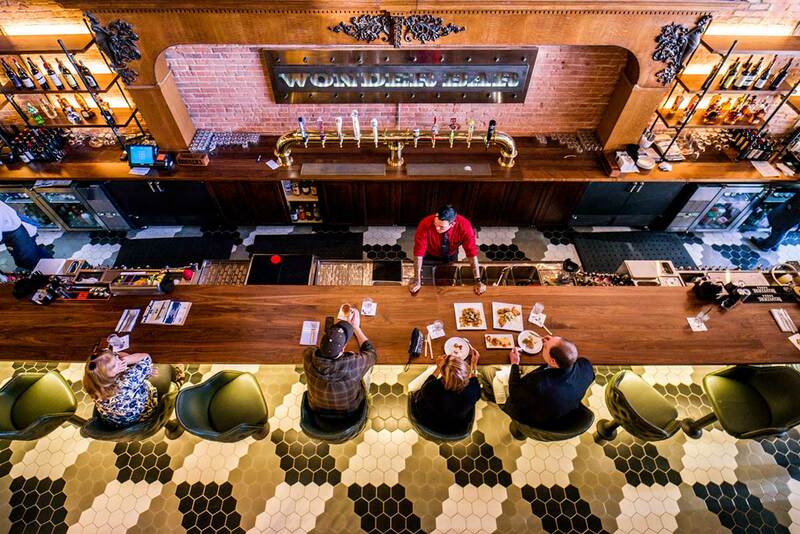 + C-85 Wonder Bar – trendy restaurant with tasty food, a large drink selection, and large screens to watch your favorite sports teams on (they have fourteen 65” tv screens and an 80 ft live wall tv screen.. so this place isn’t messing around). There are also two floors, each having different menus. + Backwards Distilling Company– if you want to have a cocktail from out of this world, this is the place for you. From classic cocktails to adventurously unique concoctions, this place does not disappoint. Come here for a good time! + Sunburst Lodge – grab your skis and head to this lodge for some time on the slopes or snowshoeing. This place would also be a great place for a staycation, the rooms are very lodgey. I didn’t get the chance to visit here but it is on my to-visit list for the next time I am in town! I am really regretting not having the chance to go here. Photo from The Snow Chasers – a great blog for awesome adventure finds! I mean, how cool is this place?! + Artisan Alley – want to get your creative juices going while jamming out to Simple Minds? Then this is the place for you! + Rialto Soda Fountain – grab a soda float or milkshake from this historic spot and chat with owners Rob and Vivian. + Rialto Movie Palace – catch a movie in this historic movie theatre (adult tickets after 5:30 pm are $10.50) and enjoy the movie from comfy reclining seats. + Wagon Wheel Roller Skating – get your groove on while roller skating at this roller rink! This rink was built in the 40’s and in the 50’s it burnt down and was rebuilt in the 70’s. There is so much more to do and see in Casper. For more ideas, check out Visit Casper! Thanks for visiting Casper! I’m happy that you liked it! Now you have to visit in the summer so I can take you hiking at the Bridle Trail, or hang out at Alcova Lake! See you soon! I enjoyed reading this post. So very interesting , and a very cozy place to visit. Thank for sharing!!! Loved it!